The OG1FYS from Oscar Schmidt is a classy small-bodied acoustic guitar promising a few intriguing features. 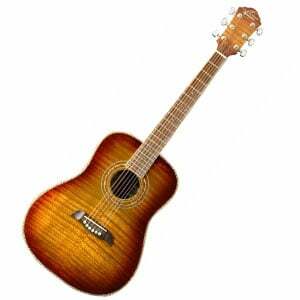 Scaled down to 3/4 of the size of a regular acoustic, it’s a popular model with complete beginners, as well as players with smaller hands, while it also makes a great acoustic guitar for kids. As usual, we’ve taken a closer look! As we mention, the OG1FYS features a 3/4-sized body, which is crafted from a laminated select spruce top with layered catalpa used on the back and sides. This is an exotic combination, which looks great, especially with a selection of colors to choose from. While the OG1FYS signifies the yellow sunburst model, you can also find a red, blue, black and natural version of this compact acoustic. Regardless of the color, with a high-quality gloss finish and attractive abalone binding and rosette, it’s safe to say that looks are definitely on this guitar’s side! Moving up the instrument and we find a strong mahogany neck with a standard rosewood fretboard, featuring 20 frets and dot inlays. Being a shorter scale, it’s a comfortable guitar if you have smaller hands, or are learning tricky new chords. Aside from this, the craftsmanship – while still mass-produced – is very commendable, and meets the expectations we had from master guitar builders such as Oscar Schmidt. There are no electronics to talk of, so our attention falls elsewhere – such as the fact that the OG1FYS comes with a set of very strong chrome sealed tuners that are capable of keeping the guitar in tune for extended periods of time (which is more than can be said of many affordable acoustics!). The rosewood bridge is attractive but functional, while the adjustable truss rod in the neck is another useful addition for ensuring the right tension and intonation. When the listed features are combined, the OG1FYS delivers a very solid sound, reminiscent of classic dreadnought models. Of course, it’s a tad quieter than your standard full-sized acoustic, but it’s surprisingly full considering the reduced soundboard. The sound is clear and the bass is quite strong and punchy, balanced nicely with the trebles. It’s not as full or rich in tone as, say, the higher-end Baby Taylor or the Little Martin, but – at a fraction of their price – it’s hard to complain. When everything is taken into consideration, the OG1FYS offers good value for money, combining a handsome design, quality craftsmanship and a decent tone into a package that almost anybody can afford. A big thumbs up from us! For more info about the Oscar Schmidt OG1FYS, click here.